Please stay on the boardwalks and tracks provided, and respect any barriers that are in place. They have been put there to protect the kauri, and especially their shallow feeding roots, from damage by trampling. Take your rubbish away with you, light no fires and take extreme care if you smoke. Pigs and goats may be hunted but a permit must be obtained from Waipoua Forest Visitor Centre first. All native plants, wildlife, natural features and historic sites are strictly protected. This is a wildlife sanctuary - please NO dogs. The Department of Conservation operates an 0800 number for members of the public to report any safety hazards. Several huge trees are easily reached from the road. Te Matua Ngahere the 'Father of the Forest', has a trunk over five metres in diameter, possessing the widest girth of any surviving kauri tree. This massive tree is a 20-minute walk from the main road. Close by are the Four Sisters, a graceful collection of four tall trees in close proximity. .
From the same access road you can follow a half-hour walking track to the Yakas Tree, the eighth largest kauri in New Zealand. 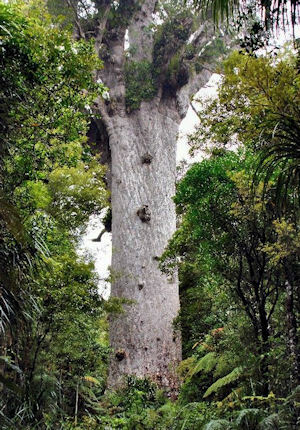 Further up the road is Tane Mahuta, "Lord of the Forest", the largest kauri tree in New Zealand. It stands close to the road and is estimated to be 2,300 years old. At 47 metres it is much higher than Te Matua Ngahere - but doesn’t have the same impressive bulk - although its total trunk volume is greater. Proclaimed in 1952, after much public pressure and antagonism at continued milling, - Waipoua and the neighbouring forests of Mataraua and Waima, make up the largest remaining tract of native forest left from the once extensive Kauri forests of northern New Zealand. The remnants are now under the protection of the Department of Conservation.There is no milling of mature kauri trees nowadays, except under extraordinary circumstances such as for the carving of a Maori canoe. On the south-eastern boundary of the Waipoua Kauri forest is the 350 hectare McGregor Memorial Reserve. It contains regenerating kauri and codocarp forest and is the habitat of the kiwi and kauri snail. The kauri snail is found only in New Zealand, is carniverous and has a distinctive brown, glossy shell 3 inches in diamater. 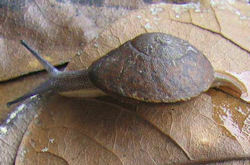 The Pupurangi (kauri snail) is carnivorous and captures and eats worms. As manuka (tea-tree) is an ideal cover under which native trees grow, it is being planted over former grassland in the reserve. To reach the reserve turn off SH12 onto Marlborough Rd, about one kilometre south of the Katui Homestead. The entrance to the reserve is four kilometres down Marlborough Road. Walks of the Kauri Coast, Northland 1, 2 & 3 is available from the Information Centre in Dargaville. The brochures cover more than 28 walks, including all the main ones in Waipoua Kauri Forest.